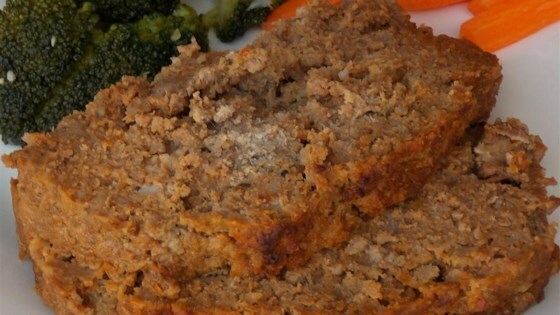 "Yummiest meatloaf I've ever tasted. It has so much flavor and stays very moist. Everyone I've served it to loves it. My kids go crazy over it and don't realize they are consuming veggies. This recipe freezes well. Whenever I take the time to do a recipe that takes time (like chopping veggies) and freezes well, I multiply the recipe, eating one for dinner that night and freezing a few more for later." Combine ground beef, ground turkey, egg, celery, rolled oats, skim milk, ketchup, onion, green pepper, parsley, dry mustard, salt, minced garlic, and black pepper in a bowl until thoroughly combined; mixture will be moist. Transfer mixture into a 5x9-inch loaf pan. Bake in the preheated oven until an instant-read meat thermometer inserted into the center of the meatloaf reads at least 160 degrees F (70 degrees C), about 1 1/2 hours. Meatloaf may still look pink inside due to ketchup. If your children don't like to see vegetables in their meatloaf at all, use your blender and blend the veggies with the milk (I use the chopper blade in a food processor). I left out the green peppers, used all turkey meat and replace the parsley with sage, then baked in muffin papers for 25 minutes. Delicious! Very tasty. I substituted mushrooms for the celery (personal preference),used only ground turkey and whole wheat bread, which helped hold it all together better. Perfect taste and consistency!!! I wanted something healthy made with Turkey and don't want to use bread crumbs. This is perfect. My 1 year old son LOVEs LOVEs it. So does my husband.